Deaths or serious injuries of persons in custody, disappearances of individuals, and allegations or indications of torture and other forms of ill-treatment can be summarised as ‘serious incidents’ in custody, which can have a variety of different causes. 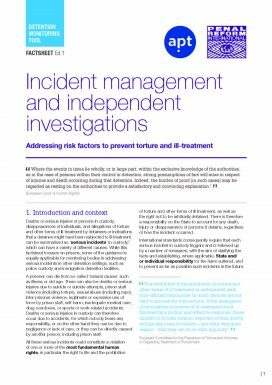 This Factsheet is intended to give guidance to monitoring bodies in assessing whether the prison authorities have fulfilled all the obligations that arise in cases of serious incidents, i.e. primarily recording and reporting these cases in a timely manner, preserving evidence, and cooperating with the investigation. In addition, the basic elements of an effective investigation are summarised.